Beggars All: Reformation And Apologetics: Origin of the term "Protestant"
Origin of the term "Protestant"
I had always thought that the the etymology of the term "Protestant" was primarily religious. The term referred to those original 16th Century people that stood against Roman theology. I recently came across the following little tidbit from Alister McGrath about the origin of the term. It came about when six German princes and fourteen representatives of imperial cities.... "protested." McGrath notes the term came about due to the Second Diet of Speyer of the Holy Roman Empire (1529) which met to primarily discuss impending Islamic armies. The second Diet of Speyer was hurriedly convened in March 1529. Its primary objective was to secure, as quickly as possible, a united front against the new threat from the east. Hard-liners, however, saw this as a convenient opportunity to deal with another, lesser threat in their own backyards. It was easy to argue that the reforming movements that were gaining influence throughout the region threatened to bring about destabilization and religious anarchy. The presence of a larger number of Catholic representatives than in 1526 presented conservatives with an opportunity they simply could not ignore. They forced through a resolution that demanded the rigorous enforcement of the Edict of Worms throughout the empire. It was a shrewd tactical move, with immense strategic ramifications. Both enemies of the Catholic church—Islam and the Reformation—would be stopped dead in their tracks. Outraged, yet ultimately powerless to change anything, six German princes and fourteen representatives of imperial cities entered a formal protest against this unexpected radical curtailment of religious liberty. The Latin term protestantes (“protesters”) was immediately applied to them and the movement they represented. McGrath, Alister (2009-10-13). 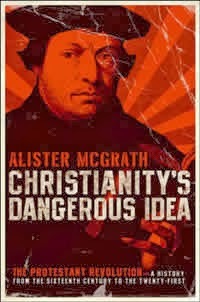 Christianity's Dangerous Idea (Kindle Locations 182-183). HarperCollins. Kindle Edition. (Kindle Locations 174-183).